I have begun work on my second book, "Orchid Care: For the Experienced Grower". Look for its release sometime later this year or early next year. Orchid Care: For the Beginner, is written in easy to understand language, covers basic orchid care, has over thirty photos to supplement the descriptions, and includes a troubleshooting guide that covers common problems for most of the popular genus. Orchid Care: For the Beginner makes raising an orchid fun, intuitive and easy to do. It is concise and could easily be read from cover to cover-the perfect tool for the beginner orchid enthusiast. Orchid Care: For the Beginner was published in November of 2015 and is featured in the June 27, 2016 publication of Publishers Weekly​. It is currently being sold on Amazon.com and barnesandnoble.com. I offer wholesale price to any Orchid Society that would like to purchase my books to give to their new members. Contact me at basorchidcare@gmail.com. I just can't seem to get enough of California! I had such a huge response from locations in the San Francisco area who wanted me to talk in January of 2019 that I decided to go back to northern California in late July/early August. I'm currently booking those location. Anyone interested in having speak or teach a class should email me at: basorchidcare@gmail.com. March 16, 2019 - Saturday - U.S. Botanic Gardens - Washington, DC - 10:30am - 12:30pm - "Entertaining with Orchids" - This is a very relaxed class that discusses orchid trivia, fun facts, and basic care. It includes a hands-on portion where all participants create an “orchid centerpiece”. We will plant an Oncidium Twinkle orchid in a tree fern basket. A plate to hold the basket and various decorations are also provided to finalize the creation. This class runs in conjunction with the Smithsonian Orchid Show. March 28, 2019 - Thursday - Northampton Community College - Bethlehem, PA - 6:30pm - 8:30pm - "Orchids for Beginners" - Orchids are the most common houseplant in America. This class discusses how orchids grow in nature and teaches basic care instructions to keep them blooming in your home. April 13, 2019 - Saturday - New York Botanical Gardens - Bronx, NY - 11:00am - 1:00pm - "Entertaining with Orchids" - This is a very relaxed class that discusses orchid trivia, fun facts, and basic care. It includes a hands-on portion where all participants create an “orchid centerpiece”. We will plant an Oncidium Twinkle orchid in a tree fern basket. A plate to hold the basket and various decorations are also provided to finalize the creation. This class runs in conjunction with the New York Botanical Garden's Orchid Show. April 14, 2019 - Sunday - Smithsonian Associates - Washington DC - 2:00pm - 4:00pm - "Orchid Afternoon: Orchids for Beginners" - This class delves into the origins of our love for orchids, explains how they grow in their native environments, and provides beginner care instructions to keep your orchids blooming in your home. In a hands-on activity, learn how to repot a Phalaenopsis orchid, one of the easiest orchids to raise indoors. 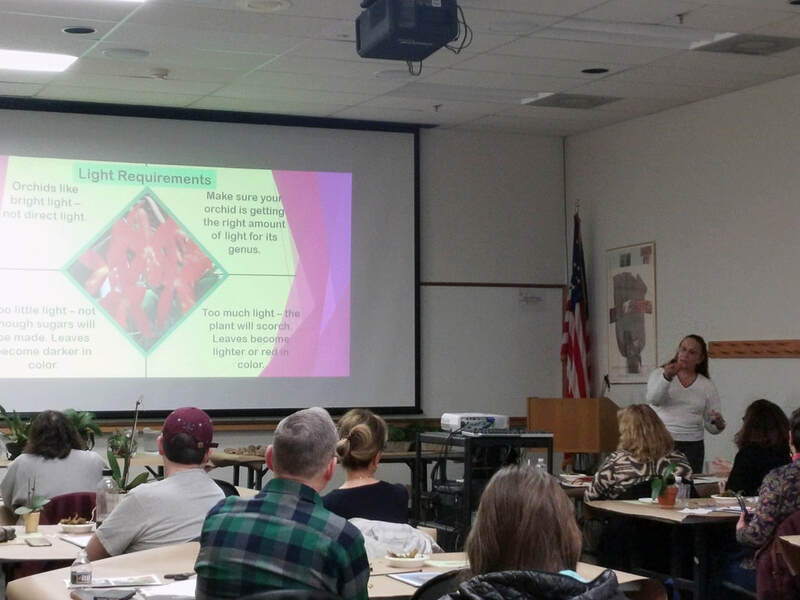 April 25, 2019 - Thursday - Northampton Community College - Bethlehem, PA - 6:30pm - 8:30pm - "Identifying Your Orchids" - To know your orchid is to love it – and to care for it better. This class will teach you how to identify the genus of some of the more common orchids. Learning how to identify your orchid’s genus will allow you to troubleshoot its specific needs.